I see that Marko Asmer and Lucas di Grassi have been left out in the cold as regards F1 this year. Both have seemed quite exciting prospects for the future but have found their continued progress up the ladder blocked by the virtual extinction of the genuine test driver. Asmer was supposedly a test driver for BMW in 2008 and di Grassi performed the same duties (or lack of them) for Renault but the restriction on testing meant that they rarely had a chance to sit in the cars. With testing banned during the coming season, the role of test driver becomes a matter of a title without any function. Only eighteen months ago I speculated on the possibility of test driving becoming a recognized specialty in F1; that has now been scuppered by the regulations for 2009. As long as the ban continues, there will be no point in teams employing a third driver to help with the development of the car - which sounds like bad news for young hopefuls like Asmer and di Grassi since they will have no opportunity to impress team managers with their speed during test sessions. In fact and as I have mentioned before, it is debatable whether a year in a testing role does anything for a new driver's preparations for F1. The rookies of the last couple of seasons have shown that being thrown straight into the deep end (Hamilton, Nakajima) may actually be a better way to enter the formula than through test driving (Kubica, Kovalainen, Piquet). It is tempting to think that a year without competing in some sort of racing blunts the competitiveness of a new driver and that this outweighs any advantage in getting to know the characteristics of a F1 car. So Asmer and di Grassi may have been done a favor by the F1 teams' lack of interest in them; they need to find drives in GP2 (for instance) in 2009 and hope that a good performance there will force attention upon themselves. It does leave the team managers having to take a bit more of a chance when selecting new drivers however. With only a record in lower formulae and a brief test run or two in the winter to go on, the boss will have to gamble on a rookie's ability to cope with the extra demands of F1. Not all drivers find the step up easy and some fail ever to settle in - Jan Magnussen springs to mind. Not that I think this will prove too onerous a task for team managers; they have worked within such a system before and can do so again. Things can be a little more complicated now than they used to be, especially in a year like 2008 where the competition in the lower formulae has not been particularly inspiring and the most outstanding factor amongst young hopefuls has been the name of a famous relative. Nelsinho Piquet is a very obvious warning not to give such dubious factors too much weight! The matter of choosing a new driver is unlikely to be a major element of the team manager's job in the next few years anyway. That bumper crop of rookies in 2007 and 2008 has resulted in almost a complete turnover of driver personnel in the sport and future changes will be more a matter of swaps and reshuffles than the entry of new blood. Smaller grids mean fewer seats and so those already in the club will be competing for drives amongst themselves; new boys will have to wait for the rare occasion of a seat remaining unfilled. And that means the youngsters will have to spend more time in the lower formulae, which gives more time for outstanding talent to develop and be recognized. The modern trend of younger and younger drivers making it through to F1 may well be halted in the coming years and the entrance age begin to ascend again. Sebastian Vettel might hold on to his record of the youngest driver in a GP for a lot longer than we expected. F1 has always gone through cycles like this. Nearly fifty years ago the youngest driver to enter the sport, Chris Amon, was only a few weeks older than was Vettel at the Indy GP of 2007. In between those years there were times when few new drivers entered the sport and others when a sudden crop of rookies produced claimants for the position of youngest ever (Mike Thackwell, Rubens Barrichello). So Marko and Lucas need not despair - their chance will come, no doubt. It is just that they may have a slightly longer wait than they expected and that might well turn out for the best in the long run. It did Fangio no harm to wait until he was 37, after all. It shows the folly of pursuing massive companies as team owners in F1. These companies push up budgets and can never be content with being in the midfield or worse for too long so you will never have big grids. Then when finances dictate they cut their non-core business and we are left wih a scrawny looking grid and some fine talent will never get a chance to show what it could do. Asmer and diGrassi are today's story. Yesterday Asmer predecessor as British F3 champion and recently deposed Honda tester Mike Conway announced that he is off to the IRL. Like the other two he is a fine driver and under more normal - pre-Max - years he would have completed at least one season of F1 now and probably more. 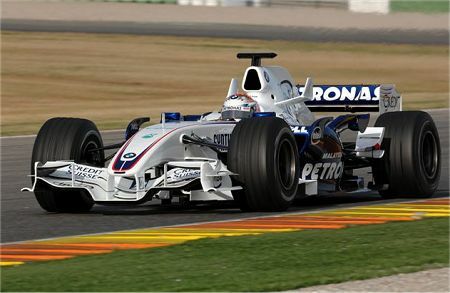 I still cannot figure what Mercedes are doing with paul di Resta for 2009. He has not been named in their DTM team although their is a car available which they have said will be his or if he races elsewhere it will go to Ralf Schumacher. ART have announced their GP2 team and as this is the best team on the grid and the team Lewis Hamilton was placed with it seems clear that he will not be in GP2 this season. I can only assume that there are still discussions going on to place him at Force India. It seems ridiculous that whle Sebastian Vettel is being hailed as the next great talent the man who beat him to the Euro F3 title as his team mate has spent the last two seasons in saloon cars. I do not approve of testing restrictions. If the technical regs were correct it would not cost a fortune to run a car after it has been built and developed. Steven, I'm pretty sure Di Resta will race GP2 next season. Yes, ART is the most successful GP2 team and McLaren/Mercedes placed Hamilton there, but they are far from the only good team on the grid and actually had a very disappointing season in 2008 (with Grosjean being only 4th among the drivers and a 5th place in the teams championship). Neither Racing (from which Pantano won the title last year) nor Campos ans iSport (#1 and #2 in last year team standings) have announced their drivers line-up yet. ART has promoted their #1 F3 driver Hulkenberg as they have previously done with Hamilton and Grosjean, the real weird thing was Di Resta getting passed in 2007 in favor of Di Grassi and Buemi. Clive's post made me think about the high number of drivers who are mentioned as pontential Formula 1 prospects that are currently without a GP2 seat but are likely to have another season there: Di Grassi, Asmer, Di Resta, Grosjean, Senna, Chandok, Parente (maybe even current champion Pantano). The lack of F1 seats made the GP2 grid likely very packed and I wouldn't be surprised gets even worse next year. You highlight one of the enigmas of motor sport, Steven - why some drivers of apparently enormous potential get so far and then disappear without trace. Not that I think this will happen to di Resta but the possibility hangs over every driver on the verge of breaking through to F1. Sometimes there are factors that we do not see, such as a driver's character. Tommy Byrne's recent biography makes it pretty clear that he was seen as a rather wild character, a loose cannon, and this excluded him from many of the team managers' lists of recruits. At other times it just seems inexplicable; I have never understood why Mike Thackwell was never given a decent chance in f1, for instance. But Filipe is right in that a bottleneck is being created in GP2. As more drivers arrive from lower formulae, the competition for seats in GP2 will increase just as it has in F1. The possession of sponsorship is going to become the deciding factor in the next couple of years, methinks. The three drivers I always use to illustrate this phenomenon are Byrne, Thackwell and McNish. They barely made 20 F1 starts between them but all of them were good enough to have raced near the front of the grid. Byrne's case has recently been gaining publicity as a result of his book which is the most incredible sports biography I have ever read. It is quite clear why he and Ron Dennis couldn't see eye to eye but there must have been mid-grid teams who coulf have taken him on and knocked a few rough edges off. Thackwell said in an article a few years ago that he had an attitude problem at the time and was a big head. I thought that was what a top driver needed. You would have thought that his honda connections would have been enough to get him a break but I guess he was a few years early to benefit from that. Honda paid him enough money to drive in F2 that he was abele to buy a plane. I will never understand how McNish never got a break. Apart from being lightening quick he was technically good and had a lot of McLaren inside knowledge that could have been useful to a lot of teams. He had also been through the Jackie Stewart charm school so was great with the media and sponsors. When Marlboro only had one F3 seat available in 1989 they had the choice of McNish or his team mate in the Marlboro sponsored Dragon Motorsport Formula Vauxhall Lotus team. They gave the seat to McNish and he won more races than any other driver and just mist out on the championship by a few points. His former team mate drove for a weak team but because McNish's results meant he had to be promoted to Marlboro's F3000 team they promoted his former team mate into the seat. His team mate was some guy called Hakkinen. No idea what ever happened to him.